Today was a huge day for BT's new sports channel, as the telecoms giant broadcast its first Premier League game at Liverpool took on Stoke City in the season's curtain raiser. 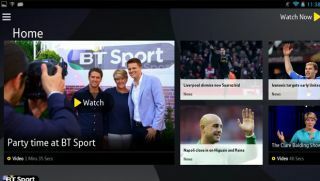 However, for some users of the BT Sport mobile app for iOS and Android, those curtains remained firmly closed as technical issues prevented some viewers from enjoying the game. Some users complained the coverage kept cutting out, while others were perturbed that the broadcast only worked over Wi-Fi, when BT promised 3G and 4G coverage. As hundreds of unhappy users took to Twitter, the company posted: "Sorry, some customers have seen an intermittent issue with the BT Sport App. We are working to resolve this, apologies to everyone affected." The issue is believed to have affected those who attempted to log in after game had kicked off, with BT claiming the problem had been resolved in time for most viewers to tune into the second half. It wasn't the best start for BT Sport, who's televised coverage of the game impressed on Saturday morning. Perhaps a few teething problems were to be expected for the newcomers? A BT spokesperson said: "Those customers who logged in before the game have experienced no issues but a minority of customers who tried to login once the game had started may have seen an intermittent issue and an error message. "Our team responded quickly and were able to make a difference so most of the customers who were experiencing problems were able to enjoy the remainder of the second half." BT has forked out £738 to broadcast 38 Premier League games a season, over the next three seasons. Next: Discover how stats have changed the Premier League forever.